Garden windows are three dimensional windows that project outward from the wall. Because they have glass on top and three sides, they bring more light into the living space. Many people use this space for house plants and window gardens which gives rise to the name. Garden windows are often found in kitchens and bathrooms, or in areas where more light is desired but where only a small window will fit. If you’re planning to replace an old double hung window, consider replacing it with a Soft-ite® Garden Window for more architectural interest. Keystone Window of Pennsylvania Garden Windows are specially designed to provide beauty, longevity, and energy efficiency. 30° sloped roof: Ensures excellent quick water run-off. Trapezoidal side vents: Allow maximum flow-through ventilation. Multi-point locking hardware and Q-lon® gasket system: Ensures a tight seal against the outside elements. 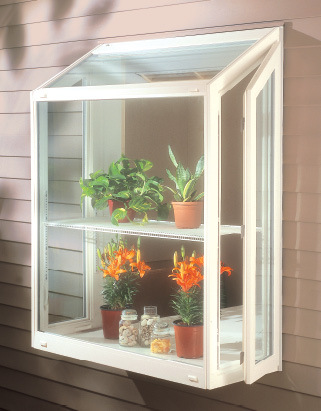 Shelves: Vinyl coated metal shelves come standard and glass shelves are optional in all Premium Vinyl Windows Garden Windows. Patented hand crank: Our slim-line, heavy duty locking mechanism features smooth-operating crank and locking hardware. Weep channels: Special weep channels at the top and bottom of Premium Vinyl Windows' garden windows help keep the interior dry. Screens: A fabric insect screen keeps the bugs out and provides high visibility. 100%, virgin lead-free vinyl: Premium Vinyl Windows' garden windows feature the highest quality vinyl and will stand up to the weather, wherever you live, for a lifetime.